The resale apparel business is booming. According to thredUP’s 7th annual resale report, the current total secondhand market is about $24 billion — that number is expected to hit $51 billion by 2023. Resale to drive growth in the secondhand apparel market. The report was put together by thredUP, an online resale shopping platform, with research and data from GlobalData, a third-party research and analytics firm. Over 2,000 American women over the age of 18 were surveyed in January. They were asked questions about their shopping habits and preferences for secondhand items. According to the report, 56 million women purchased secondhand products in 2018, up from 44 million women in 2017. “The data really speaks for itself. 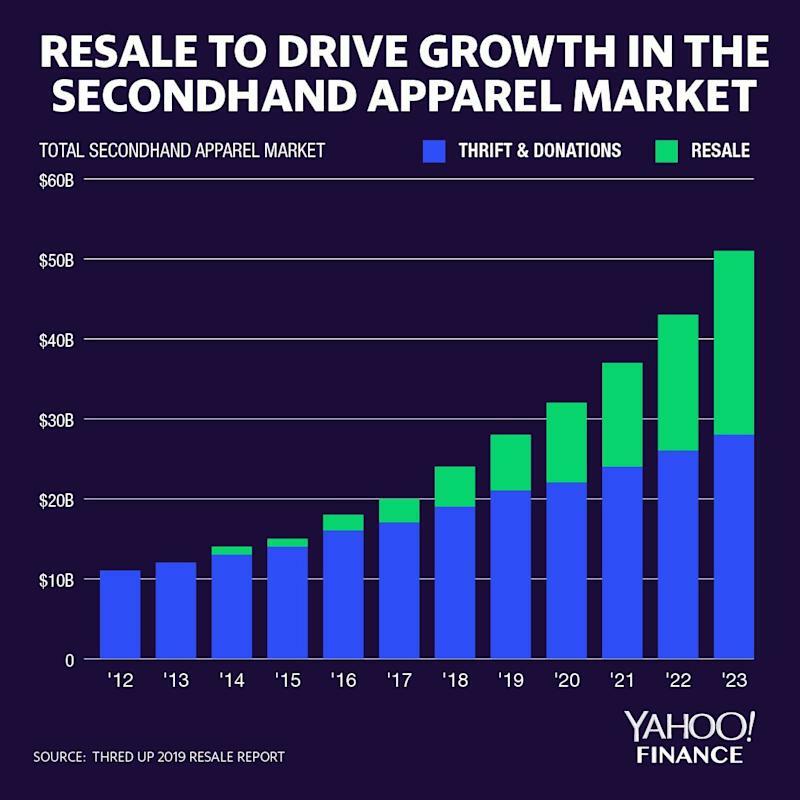 This year more than ever, you can see how much secondhand is starting to capture the attention of mainstream shoppers,” James Reinhart, co-founder and CEO of thredUP, told Yahoo Finance. Moreover, 51% of resale shoppers indicated that they plan to spend more on secondhand in the next five years. “Once people start buying secondhand, they buy more of it over time. When the consumer has that experience of buying a Theory dress for $20 versus $300, they can’t imagine going back there and paying full prices,” Reinhart said. ThredUP and GlobalData found that resale has grown 21x faster than the retail apparel market over the past three years. In an environment where traditional retailers continue to struggle to adapt to changing consumer tastes, companies like Rent The Runway, thredUP, The RealReal and Poshmark are capitalizing on the idea that consumers are constantly looking for affordability and variety. “We are calling it the end of long-term ownership. The number of items in a consumer’s closet continues to decline. People are moving toward a world where their closet is on constant rotation,” Reinhart said. Wall Street has started to take notice to the growth opportunities within resale apparel. In a note to clients on March 15, Piper Jaffray compiled nine key themes that investors should pay attention to for the future retail industry. One of the themes is the resale economy. “These [resale] platforms see a high level of consumer engagement ... We believe the resale industry and its impact on primary markets will be something to watch over the coming years,” analyst Erinn Murphy said. In addition, cohabitation between brands and consignment sellers can potentially benefit parties involved, said Rati Levesque, chief merchant at The RealReal, an online consignment platform that resells of luxury products. “Primary market brands have started to realize that consignment players are helping extend the discovery, reach, and covet-ability of their brands. An item with a strong resale value can strengthen the brand as a whole,” Levesque told Yahoo Finance. 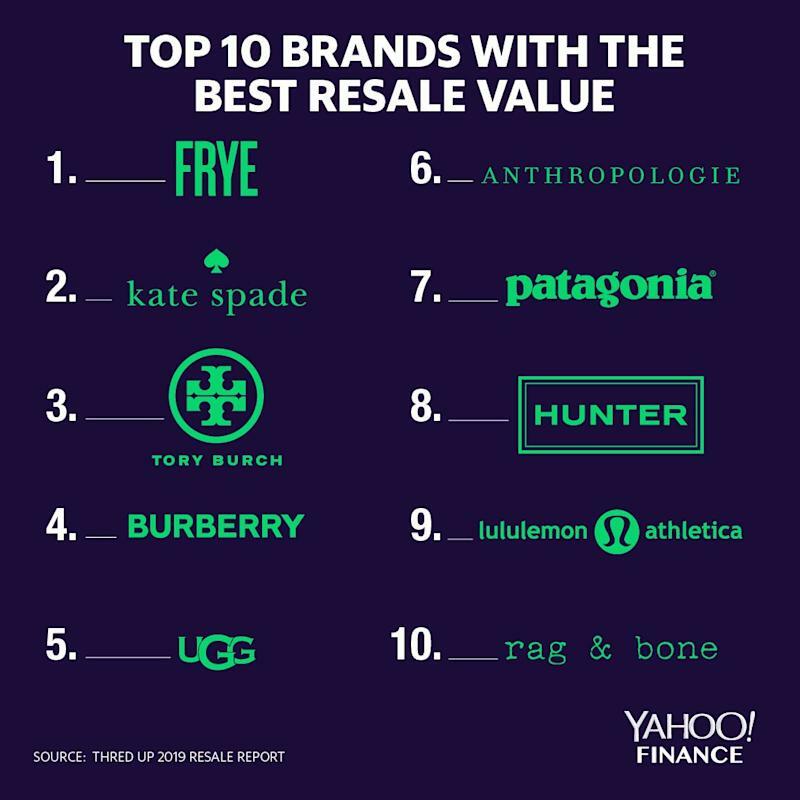 The 10 brands with the best overall resale value include mid-tier designer brand Kate Spade, owned by Tapestry (TPR), and athleisure brand Lululemon (LULU). “People resell or clean out their closets for all sorts of reasons. Lululemon is a good example of a brand with strong residual value,” thredUp’s Reinhart said. Author Marie Kondo and the KonMari method have captivated the public since the debut of her book “The Life-Changing Magic of Tidying Up: The Japanese Art of Decluttering and Organizing” in 2011. After Netflix released a special series about Kondo at the end 2018, thredUP saw a noticeable surge in business. “When her Netflix special came out in December, we saw a huge spike in people looking to clean out their closets after watching that show,” Reinhart said. After Kondo’s first show, thredUp saw an 80% surge in Clean Out Kits, bags the company sends to customers to send in their items for possible sale. Consumers are also more conscious about sustainability and ethically-sourced fashion, the study found. In 2013, 57% of consumers preferred to purchase from environmentally-friendly brands. That number jumped to 72% in 2018.